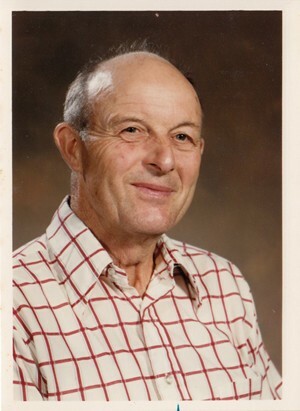 Orville Lester Cline died on April 9, 2013. He was 91. He was born on July 15, 1921, in Parker, Ore. to Lester Carl Cline and Marie Lydia Wacken Cline. He married Gena Muller on June 11, 1950. Mr. Cline grew up on his grandparent’s farm in the Independence area. He and his brother Leroy helped their parents with the farm operations, raising chickens, hogs, cattle, grain and hay. He attended Parker Grade School and graduated from Independence High School. He was active in the Independence FFA Chapter. He attended Oregon State University for three years before entering the service in 1942. After an honorable discharge from the Air Force, he completed his studies at Oregon State University with a degree in Agricultural Education. He spent three years teaching agriculture at Grants Pass, in the veterans program, giving instruction on farming practices. In 1950, Orville and Gena were married and moved to Gena’s parents’ farm southeast of Molalla. Mr. Cline helped organize the Teasel Creek 4-H Livestock Club and was a 4-H leader for 20 years. He was a superintendent at the Clackamas County Fair and belonged to the Clackamas County Stockman’s Association. He was employed by Molalla River School District (at that time known as the Molalla Indians) as a custodian for 10 ½ years. He liked to make wine from many of the different fruits on the family farm and would often times offer samples to neighbors and friends. He was active in the Molalla Grange 310 and did cider making demonstrations at the Molalla Apple Festival. When he retired he and Gena took advantage of the trips offered by the Molalla Senior Center. He is preceded in death by his wife, Gena Cline. He is survived by his son, Carl Fredrick Cline; and daughter, Christine Cline. A memorial service will be held at Smyrna Church 31119 S. Canby-Marquam Highway at 2 p.m. on April 13, 2013, and a graveside service at Adams Cemetery at 11 a.m. on April 19, 2013.